I have been a Trustee of NETA for over 10 years, my first “visit” to the Aphasia Clinic, then called, was in September 2000. My stroke happened mid April that year which was a massive shock to me, my family and my friends. That was not part of my life plan, especially as it happened in my mid 40's. I attended the Aphasia Clinic to improve my communication skills and really to restore my personal confidence levels, which were at a low. The Clinic was a positive turning point in my life. Everyone involved, the staff, students and volunteers, gave me a better understanding, a direction and a further purpose in life. I will always give my eternal thanks to those great people, many of whom I class as life long friends. The birth of NETA was because of the Clinic and it's vision to improve life for those who have aphasia and to support their families and friends. I admire enormously the people who are the backbone of the NETA team. We have achieved much, though it has never been easy, sometimes difficult, especially when we are a small charity and the majority of the Trustees have had a stroke or a brain trauma. 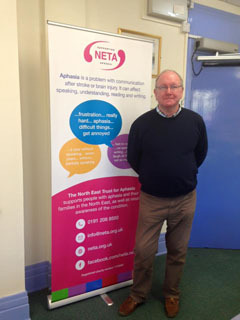 With many new avenues to explore for NETA, and to continue with the great work that has been done so far, gives me a pride, satisfaction and a desire to help more those people who suffer from aphasia. Gordon was elected on October 1st 2015 as the new chairman, taking the role from Janet Speight. He has been a Trustee for 10 years and has also been a volunteer to Aphasia Clinic during 2003-2006. Gordon's work background is in Training and Management Development with Retail organisations, his last role being with Aviva as a National Accounts Manager.